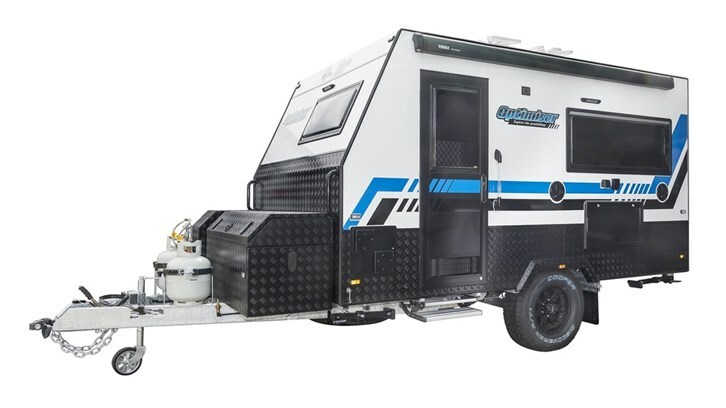 TOW 12FT...LIVE IN 15FT The Optimiser has a rear slider that extends the caravan an extra 3 ft once the caravan is in at its destination means you only need need to 12 ft of caravan and when you get to the destination you can slide out the back and live in 15ft. With a North/South bed, 2 seat dining, shower/toilet combo, internal & external cooking and a host other features internally and externally, its hard to not to look past at the Optimiser as the perfect 'Little Caravan' for you. If you are looking for a caravan that is easy to tow and has all of the luxuries that a big van and hasn't got the big price then you can stop looking.. you have found it! North/South Double Bed, Shower, Toilet, Hot Water, 105 amp Battery, 130wSolar Power, Indoor Dining, TV, Air-Conditioning, Internal Kitchen, External Kitchen, External Shower its all in there and at only 12ft it's easy to tow and a no fuss set up. You may not belive that we can fit all of this in but its true! This 'OFF ROAD' Chassis comes complete with independent suspension and a 6 inch galvanised chassis to provide extra strength against the rugged australian terrain. All our chassis are supplied by G&S Chassis, so you now that under the caravan is a great as what is on the top. At 'The Little Caravan Company' we aim to get everything into this layout of a 12ft caravan that we can. Our layout includes as much as we possibly get into the Optimiser, however... Because we build everything in the factory and can customise the Caravan to what you need we can be easily swayed into creating a layout of your dreams, and making the Optimiser the caravan of your dreams. Wanting to go OFF-GRID and utilise FREE campsites? This is what this little van has in it!